Thank you for sharing this. 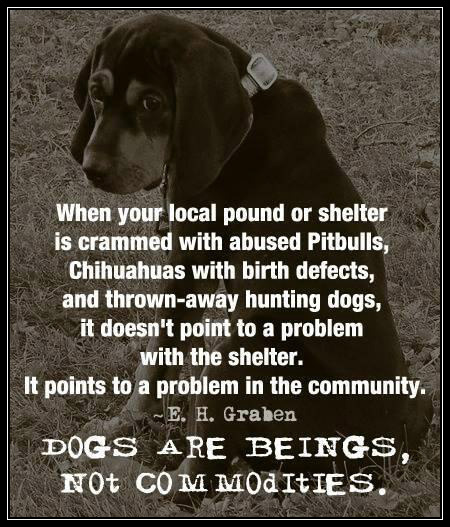 I agree and have always thought that with any breed, you simply cannot get away from generations upon generations of breeding for certain characteristics. It’s why some dogs make great hunters and others don’t and why some make great therapy dogs or search and rescue dogs while others will never be able to be properly trained as such. I’m not saying that pit-bulls or any breed should be euthanized or cast out simply because of their breed — but glossing over the characteristics inherent to a particular breed is not doing anyone any favors, least of all the dog. And it always annoys me to no end to see a bite case or other aggressive case have an overwhelming wave of support of people coming out of the woodwork to adopt this one “misunderstood” dog when shelters are filled to the rafters every day with dogs who are friendly, have never done any harm and yet no one seeks to adopt THEM. When denied that one aggressive dog they want, I wonder how many of those “dog people” adopt one of the other needy dogs living right in the next cage? Not many I bet. Thanks! I appreciate the sentiment. 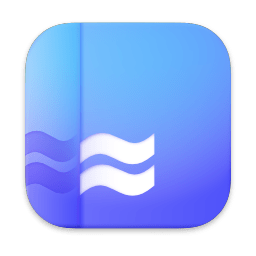 I’ve been told in the past that I “deserved” to be bitten, and for some time now I’ve ruminated about writing the post, as unpopular as it is likely to be. I also don’t promote the idea that pit bull types should be euthanized on sight, since the vast majority of them cause no problems. 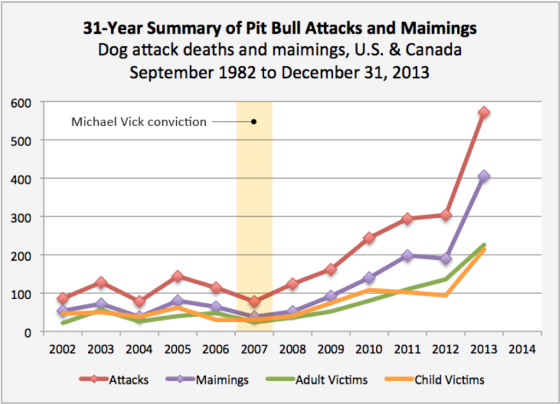 But the “blame the victim” culture has to end, and pit bull advocates have to face the stats objectively. There are some estimates (including my own) that suggest approximately half of pit bulls will attack at some point. This is impossible to prove, but there is evidence enough for me to believe it’s true. When getting to know many pit bull owners in the past, I’ve learned that most will tell a story of serious aggression from their dog after they get to know you or have a few drinks. 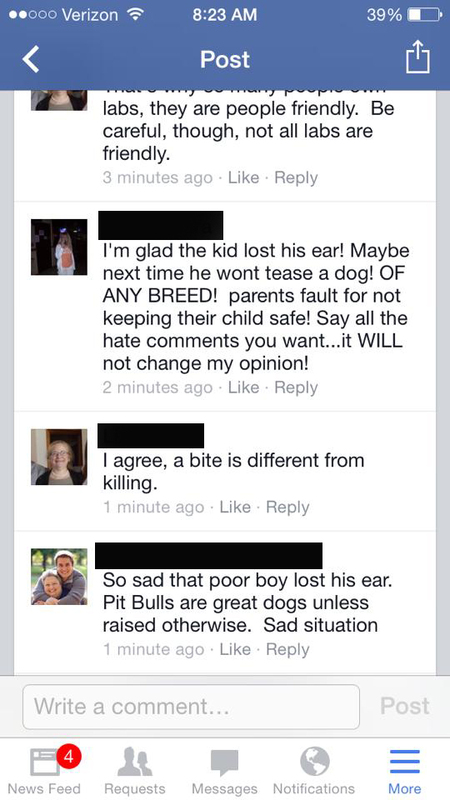 These are the same folks who weeks or months before said their pit is an angel. Excellent article. Pit bull advocacy is a sham. They don’t care about the dogs at all – just protecting breeders, dog fighters, exploiters, and abusers. PBAM needs to acknowledge the unique characteristics of the breed, teach adopters how to manage these traits, demand mandatory spay / neuter and put breeding of pit bulls into the hands of dedicated professionals, and set up these dogs for success. If they truly loved the breed they would protect it, not prostitute it! Thank you for this very well written account of the facts about this issue Heather. I am sending it on to a couple of people I know who believe that pit bulls are just misunderstood and none of them will ever bite a human if they are just loved enough. Thank you so much for this extraordinary blog posting. That part from the Animal Farm Foundation was a real eye opener!!! Excellent article!! It also makes one furious (as it should!). These dogs should NOT be in community neighborhoods. So sick of reading all the excuses from pro-pit people that pretty much sum up to an “Oh well” attitude at the expense of OUR children, loved ones, pets, and livestock. Personally, I’m always wary of what I call ‘big, potentially dangerous dogs’. (could be more or less any big breed or mixes). I love all animals, and I don’t believe dogs are evil. However, even the kindest, sweetest dog in the world could bite if it gets stung by a bee or something similar. I’m not afraid of toy dogs, because if they do bite, it doesn’t do any harm. I guess what I want to say is that dog owners should care enough about their dogs that they take care to keep them tightly leashed and safe in other ways. It’s not the dog’s fault that it bites, but some dogs do bite. Well-written, with intelligent and often damning observations. These dogs are so very different from other dogs, and they are supposed to be that way. 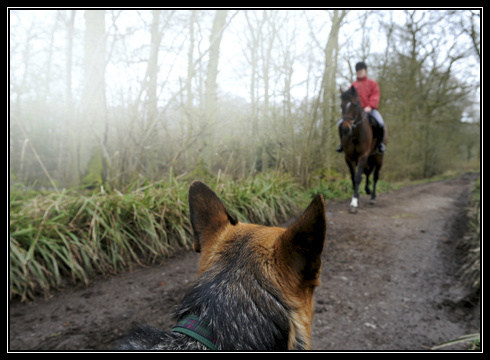 Extreme sport dogs with no more sport to engage in; no wonder they do the damage that they do. I particularly found the AF revelations and the section on predation sequences highly interesting; so many Pit owners and protectionists INSIST that Pit Bulls will give all due warning of an impending attack, when we know that this is not so. In your words, “while dogs generally engage in “ritualized” forms of aggression when they come into conflict (growling and posturing but no real damage) when pit bulls fight they engage the grab-bite/kill-bite part of the predatory sequence with often fatal or near fatal results. There is seldom time to intervene to rescue the other dog (or human) before serious damage is done.” Thank you for the time and effort expended on this article; very well worth it. Thanks for a well researched blog. The only commentary I can add is pit bull owners as a whole are not policing who gets them, how they are treated, when to euthanize for aggression, getting spay/neuter, or other responsible action to prevent attack, therefore, the public will never be safe as long as they coexist with us unawares. Its the dogs AND the owners. another sleazy ploy of the AFF is to persuade shelters and rescues to transfer ownership of dogs to relieve them of liability. remove the potential threat of liability and nothing stands in the way of placing poor misunderstand pibble in unsuspecting homes. excellent blog. you can’t shine enough light on jane berkey and company. thank you. The problem is that they have arguments for diametrically opposed propaganda, right? Either they are nanny dogs, which fuels the notion that they are completely harmless and may, in fact, be a reasonable babysitter for your kiddos, or, if that dog happens to maul that child, they screech about the irresponsibility of the owner for leaving the child unattended. Either the dog is not readily recognized as a pit bull and/or the “pit bull” is not a breed and therefore DBRF info is sketchy at best, or if that dog happens to do something good, there’s no QUESTION that the dog is a pit bull. Or if there’s a pit bull walk or some other awareness event, there’s no question which dogs are the bully breeds as their narcissistic owners gather in droves to parade their maulers around town. Either nurture will completely wipe clean the dog’s heritable temperament and will turn the bully breeds into uglier retrievers (enough love and goo goo eyes will do that, ya know), or the fighting nature of the dog has been culled from the breed and there’s no reason to worry about the prey drive and gameness of the breed. You CANNOT win an argument against the PBAM. Thankyou for this article. My next door neighbors, who rent , have a 2 yr. old pitbull. He is massively built, and unfortunetly intact. Their yard is not totally fenced, he has escaped several times, and has been in a fight with another pitbull who strayed into their yard. I have had serious conversations with them about neutering him and completing the fencing but to no avail. I did have more liberal views on these bully breeds, but your article has enlightened me. This isn’t an attack (although I’ve written a novel), so bear with me. Please so a bit of research on Bully Breeds (XL, XXL, Pocket Pit Bulls). Via your post: CDC report on dog-bite fatalities from 1978 to 1998 confirms that pit bulls are responsible for more deaths than any other breed (the CDC no longer collects breed-specific information). New “variations” of “Pit Bulls” came into being in the 90’s. By 2000, it was a pandemic. People are willing to pay thousands of dollars for designer “pit bulls” who aren’t APBT, SBT, or AST. I own an American Pit Bull Terrier from the Ferguson’s Red line. She’s bred to pull and has no aggression issues (she’s three years old, therefore fully mature, and plays with our mice and hamster, children — she also adores frogs) who went through intensive obedience classes, socialization classes, and loves agility lessons. This — as per the topic of this blog — is my personal insight. There are numerous dogs who can fit the “physical” aspect assigned to the breed — which isn’t a breed at all but physicality — bulky, squared head, etc. However, any registered animal (AKC or UKC) will never weigh over (unless they are over-loved and fed) 60 pounds). The Staffordshire Bull Terrier will never weight over 40. And the American Staffordshire Terrier will never weight more than 85-88lbs. At the moment, papers are hung (actually, this happens more often than not nowadays). A good example? Hulk The “Pit Bull” (I’m only using that as slang for numerous animals who fit the “bill” due to characteristics). He is not any of the breeds mentioned above. He seems like a good animal, but he is not a “breed”. He is a dog that was created by those who want money and therefore breed more of the same for that very reason. There is another “breeder” who has “pocket pitties” that sell for over 3k each. They have kinked tails (a huge no-no) and do not conform to standards). This is why dogs who fit this description suffer so much. 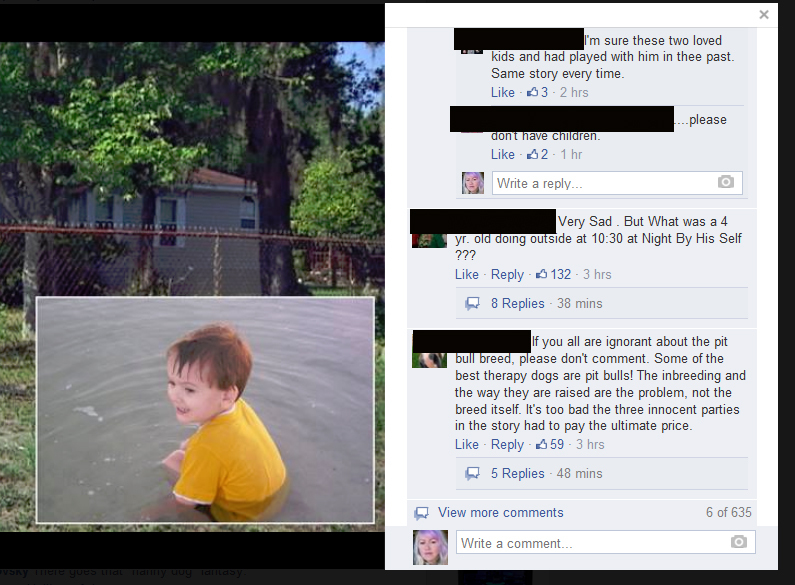 These people breed puppies during each heat (and are renowned for inbreeding) without a care in the world. In the end, humans are to blame for this crisis. I advocate for “bully” breeds but I’ll be the first to put down one if any aggression is shown. It’s awful and cuts like a knife but I have to spend time with solid animals who can be a part of a loving home. That is my job (well, it’s not my job, but I volunteer to foster because a dog is a dog — it’s up to me to do the testing and decide who passes and who doesn’t). I’d never place an unstable animal with anyone. I take the time to educate each owner on the energy level, grooming, and care required for every animal I care for. Not all “evangelists” are what you might think. Many of us work very hard to care for animals that would be dead otherwise. Each life saved is a bonus, which makes the time spent worthwhile. As for the numbers you list (attacks): numerous bites/attacks go non-reported. It’s unsettling but it’s true. I had numerous stitches on my face due to a Yorkie of all things. She got me good. But do I hate Yorkies? No. I’ve also been bitten by Shepherds, Labs, Goldens, Blue Heelers, Australian Shepherds, and a wolf-hybrid. I don’t blame any of them either. 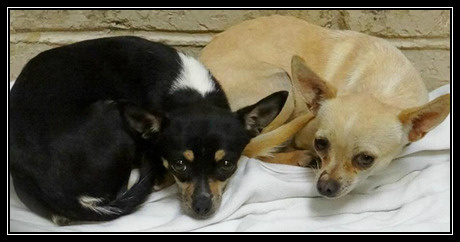 Each was in a bad situation, insecure, and had no training whatsoever. Ultimately, you are talking about a DOG. And while I don’t like the breeding I mentioned about, I do not condone all those animals to die. I’m simply stating the bite rates are probably due to such a thing, as well as owners who do not anticipate (or research) the animals they bring into their home. First off let me say that I’m glad to read that you have standards. I don’t actually despise any phenotype of dog, but I’ve had two very negative experiences with pit bull types. The people I interpret to be most responsible for the overbreeding, abuse, and yes, unrelenting promotion of pit bull types are those who continue to perpetuate the Nanny Dog myth and want to save an aggressive dog of any breed at any cost. Dogs who have killed or seriously hurt children have become celebrities. To me, this is a kind of sickness in society masquerading as compassion. Right now there is a petition circulating to rescue the Sharpei/Fila dog who attacked a Hamilton, Ontario man who later died. Although the pathologist has stated that he died of causes other than a dog bite, it would seem hard to deny that the dog was a proximate cause. And although the pathologist acknowledges that there are bite marks on the deceased man, the petition makes false claims about this and is presumptive about the cause of death (when in fact it has not been announced) in order to garner signatures. I’ve read bulletin boards in the Toronto area where pit bull owners arrange “dates” for their dogs. Advertisements often start……”my girl needs a boyfriend this week.” I’ve never seen any other breed advocates or dog owners meet in this fashion, with no standards for mating their dogs other that it be a pit bull (their words). BSL advocates don’t play any role in the overpopulation and occasional abuse of these dogs. The issue I have with any dog really is that as companion animals, we’re not asking a lot of them if we expect to be reasonably safe around them. We don’t make this claim about wild animals because they are untrained and undomesticated, so no one really blames them if they attack us. A dog that mauls or kills a human, another pet, or livestock isn’t really much of a companion animal, so I’m amazed that people want to adopt them at all. When a shelter is deciding whether to place a dog or euthanize it, they have to realize that they are charged with the responsibility of protecting people from themselves. BSL (in Ontario at least) doesn’t condemn dogs to death. I’ve never read of a single incident where a dog fitting the description of a pit bull was seized in this province. I’ve challenged people who claim otherwise but they’ve never responded with any proof. But we had a serious problem with the dogs, especially in Toronto, and we can’t claim that all the bitings and maulings were caused by gangbangers using the dogs for malicious purposes. Everyday people owned the dogs and somehow lost control of them or refused to muzzle them when the law required them to do so. The dog in this article is very likely to be illegal as well, unless it’s 10 years old and therefore grandfathered – http://news.nationalpost.com/2014/09/26/toronto-police-shoot-and-kill-a-pitbull-after-batons-are-not-enough-to-release-its-lock-jaw-grip-from-shih-tzu/ – Toronto Police Shoot and Kill a Pit Bull………. I have done a lot of research on this subject. 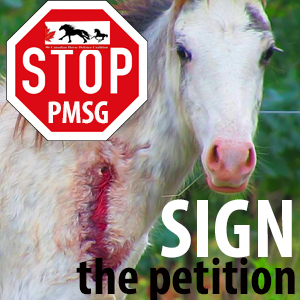 Witnessing an attack on a horse was the catalyst that started me on that path a long time ago, way before BSL came to Ontario. http://www.ncbi.nlm.nih.gov/pubmed/10997153 – Breeds of dogs involved in fatal human attacks in the United States between 1979 and 1998. During 1997 and 1998, at least 27 people died of dog bite attacks – currently now the rates of fatal dog bites are much higher, with someone dying at the rate of about one every 7-10 days. http://www.ncbi.nlm.nih.gov/pubmed/25311183 – Dog Bites of the Head and Neck…. http://www.ncbi.nlm.nih.gov/pubmed/22753529 – Effectiveness of breed-specific legislation in decreasing the incidence of dog bite injury…. http://www.ncbi.nlm.nih.gov/pubmed/24673506 – Is that dog a pit bull?